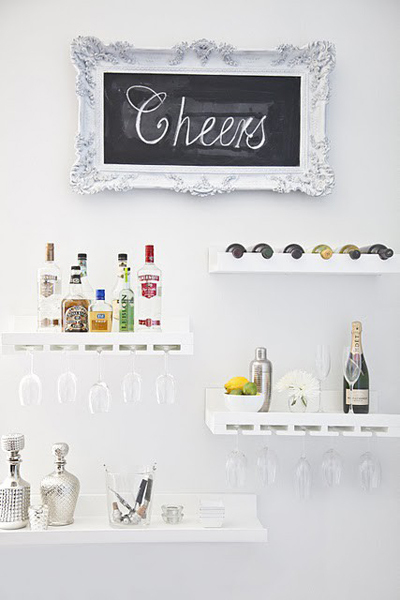 A home bar setup is a must have if you like to entertain and are becoming more and more common. I keep spotting them in all my favorite design magazines. 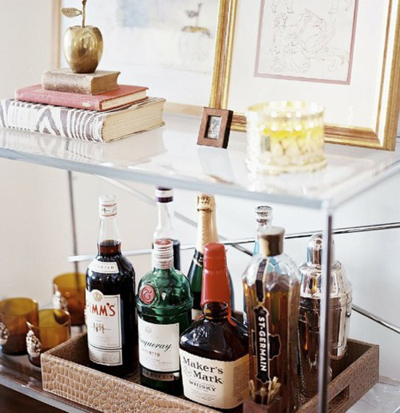 They can be as simple as a basket full of liquors, a shaker and a few cocktail napkins or as elaborate as a bar cart full of top shelf liquor and all the accouterments. 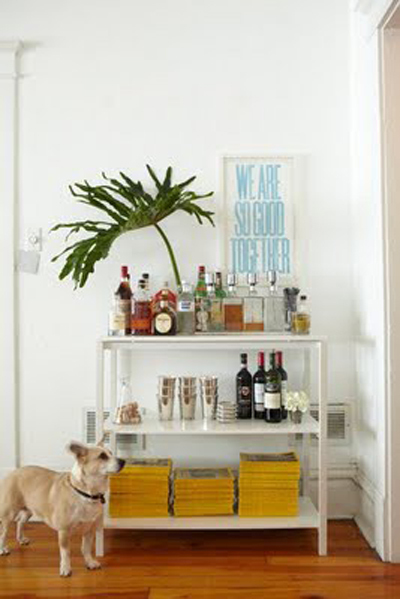 We outfitted a small vintage wooden credenza that we picked up at a thrift store for $15 as our home bar. It's the perfect size and has great storage. If you will be entertaining at all this holiday season it's a good idea to stock up on the necessities. A few basic liquors that you will always want to have available are vodka, tequila, gin, and rum. 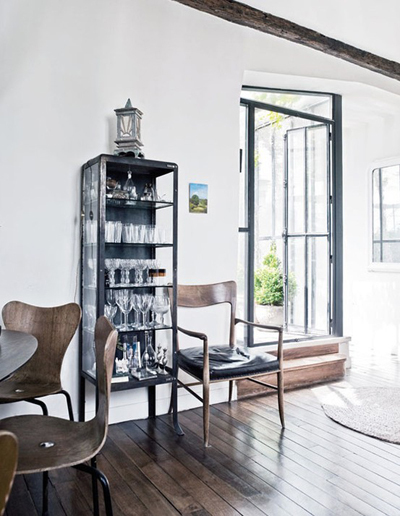 You can also get fancy and show off to your friends a little by keeping a nice bottle of scotch and bourbon around. You can't host a party without good wine and beer. Pick up a few of your favorite craft brews and choose a favorite, inexpensive wine that you can use as your "house wine". Buy it by the case for a discount and you will always have wine on hand. I always like to keep a bottle of champagne chilling in the fridge for those special, unexpected 'good news' announcements or just because! Stock up on basic mixers like soda, tonic water, cranberry and orange juice and keep an assortment of garnishes nearby for adding the finishing touch to a cocktail - cherries, lemons, limes, and olives are perfect. I like to use small vintage silver plated cups and dessert bowls in different styles to keep garnishes and mixed nuts and snacks handy on the bar. Some essential bar tools are a great cocktail shaker - we picked up a beautiful glass vintage shaker for $10 at a local antique store. I'm not into those fancy, expensive gadgets that open wine - a waiter's corkscrew is simple, functional and easy to store, an added bonus is that it can open a beer bottle too! A shot glass or jigger is also handy. We use a vintage pyrex beaker like this one and display metal martini toothpicks in it while not in use. 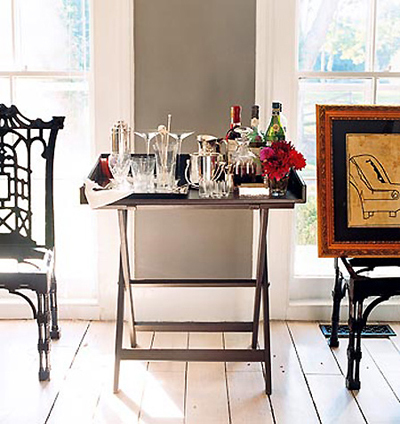 A small ice bucket and tongs or a scoop are also a necessary addition to your bar. 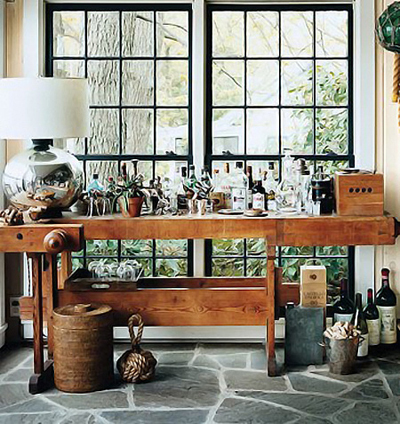 Once you've got your bar essentials, find a corner of your home where you can set everything up. Create a fabulous holiday play list, make some yummy hors d'oeuvres and invite over your closest friends for a holiday bash!